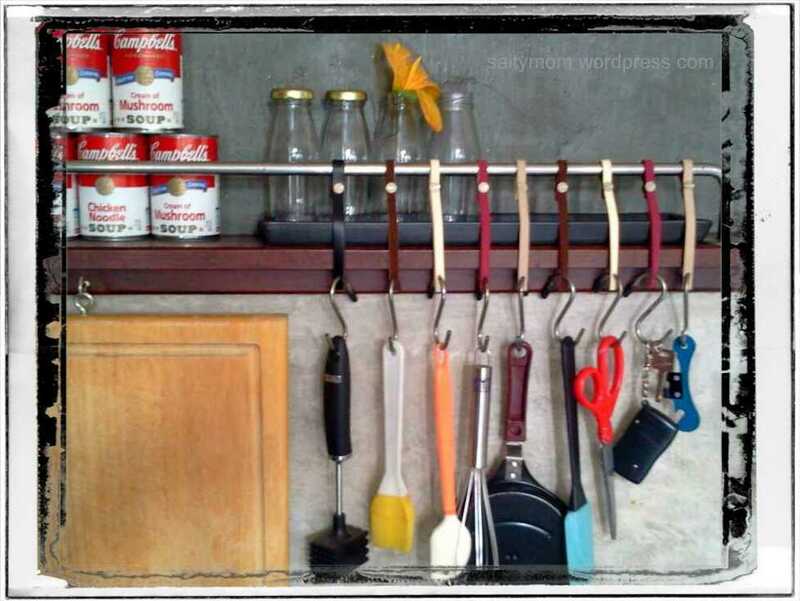 Diy Hangers for Kitchen Utensils — Super Easy ! We re-installed our kitchen rail vertically some time ago as it jutted out too much horizontally. I think maybe this was supposed to be a towel rack, not sure as we bought it second-hand. I like the new installment since I can now open up my cookbooks without having to hold them in place with Campbell soup cans. However, I still wanted to hang my kitchen utensils up on the rail so here is what I did. Color suede straps I hoarded ages ago, cut to size. Glued together for extra strength. This is another version, in leather, for the heavier kitchen utensils. The nuts and screws are actually from my handbag supplies stash. They are really multi-functional. I’ve used them to make adjustable handbag straps , as “feet” on the bottom of the bag, and as decorations in place of studs. This is really amazing idea!